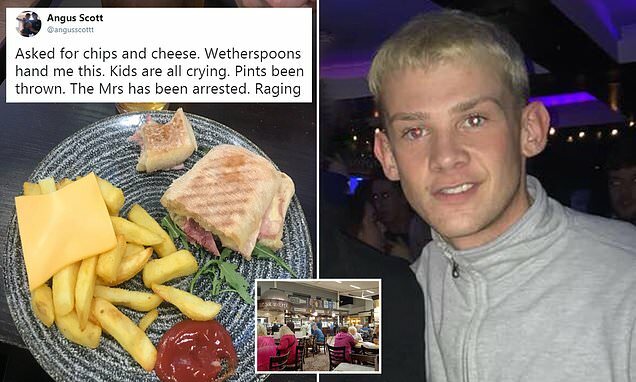 An enraged diner has sparked hilarity online after posting an image of the 'chips and cheese' he received at a Wetherspoons pub earlier this week. Angus Scott took to Twitter on Tuesday to post an image of the meal - which consisted of a slice of processed cheese dumped on a side of chips. The Dundee University student joked about the meal, served at Edinburgh Airport, saying it had led to kids crying and pints being thrown. It's certainly a far cry form the grated cheese that is usually sprinkled over the dish to make the classic chips and cheese. Captioning his image, he described the chaos that ensued after receiving the meal.